Désilets, Andrée and Julia Skikavich. "Jean-Charles Chapais". The Canadian Encyclopedia, 25 September 2015, Historica Canada. https://www.thecanadianencyclopedia.ca/en/article/jean-charles-chapais. Accessed 20 April 2019. Jean-Charles Chapais was a Father of Confederation, participating in the Québec Conference in 1864. He was a strong advocate for Canada East and served as the Dominion of Canada’s first minister of agriculture. During his career, he helped influence legislation related to agriculture, settlement and education. He is a key player in the history and development of the Saint-Denis region of Québec. The Chapais family settled in New France in 1740, and the family name was well established by the time Jean-Charles was born. His father was a merchant, and the Chapaises were considered a well-to-do family that was politically active in their community and parish. Chapais’ upbringing provided him with superior schooling, which was augmented by a classical education administered at the Séminaire de Nicolet from 1824 to 1830. He also spent two years in Québec City taking private English lessons and making contacts in Québec society. In 1833, his father bought him two plots of land in the fief of Saint-Denis. There, Chapais conducted business as a farmer and wholesaler. His business interests are often credited with having attracted settlers to the region. His ventures, and the substantial dowry of his wife, Georgina Dionne, made him extremely wealthy. Jean-Charles Chapais’ political career developed out of his position as a central player in the economic and social development of Saint-Denis. He worked tirelessly for the Church and helped incorporate the parish in the region. He was involved in building a chapel in 1839 and a parish church between 1840 and 1856. He was also active in organizing education for the community and setting up a public library. Chapais was instrumental in the incorporation of the municipality and became its first mayor in 1845. He later served as its first postmaster in 1849. Within a few decades, Chapais guided Saint-Denis from a sparsely populated village to the most organized municipality in the region and a prosperous civic centre. Chapais was propelled toward a political career by his local successes. It was his father-in-law, Amable Dionne, a representative in the Legislative Assembly, who encouraged him to seek election. Chapais initially protested that he had never wanted to be a member of Council, but continued pressure from Dionne, his wife and friends prompted him to stand for election in 1850. However, he lost to Luc Letellier de Saint-Just, of the Parti rouge. The two remained political rivals and fought five more bitter electoral contests between 1850 and 1857. The results were often disputed and, at times, even declared invalid. A member of the Parti bleu, Chapais beat Letellier in 1851 and then served as the member for Kamouraska in the Legislative Assembly until 1867. He supported the Conservative leaders of the time: Augustin-Norbert Morin, Étienne-Paschal Taché and George-Étienne Cartier. Chapais was known for his modesty and unselfishness, but some historians have commented that those qualities also limited his influence in political life. In 1864, he became the commissioner of public works in the Great Coalition government of John A. Macdonald and George Brown. 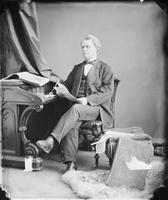 As a member of Cabinet, Jean-Charles Chapais participated in the work that paved the way for Confederation. He attended the Québec Conference of 1864 as a delegate. Though Chapais barely said a word at the conference, his dealings with the other delegates are noted for having negotiated on behalf of Canada East for provincial governments to have greater power in the federal system. See also Québec and Confederation. In 1867, Jean-Charles Chapais was elected as a Conservative to represent Kamouraska both provincially and federally, but lost both seats due to electorate irregularities. He took refuge in Champlain, which he won by acclamation in December 1867. Then in July 1867, Sir John A. Macdonald appointed him as Canada’s first minister of agriculture where he was nicknamed the “little nun.” In January 1868, while still serving as federal minister of agriculture for the Conservative government, he was appointed to the Senate for the division of La Durantaye. He was receiver general from 1869 to 1873. Chapais was a politician who monopolized power in Québec City and Ottawa after the formation of Canada; he served as a minister of the Legislative Assembly in Québec and as a senator and minister in Ottawa. When the double mandate (in which federal members could also sit in provincial legislatures) was abolished in 1874, he withdrew from provincial politics. He resigned from federal government two years later. Historians believe his resignation was rooted in the New Brunswick separate schools question and pressure from constituents to give up his ministerial post in protest. However, Macdonald also was trying to diversify and strengthen his Cabinet in the midst of the Pacific Scandal and is believed to have asked Chapais to resign his post. The Macdonald government fell in 1873. Despite stepping away from elected politics at that time, Chapais remained active in the Senate until his death in July 1885. Though Jean-Charles Chapais was rarely at the forefront of political life, he did have influence on legislation concerning Canada East, including agriculture, settlement, education and the abolition of the seigneurial system. He also played a role in planning the Intercolonial Railway and developing the Grand Trunk Railway, of which he was appointed a director by the government. He is most remembered for his immense contributions to the institutions and history of Saint-Denis. JEAN-CHARLES CHAPAISA biography of Jean-Charles Chapais, businessman and politician. From the Dictionary of Canadian Biography.